Jinxy Knows Best: Gaiam TPE Yoga Mat Only $13.99 - TODAY ONLY! Gaiam TPE Yoga Mat Only $13.99 - TODAY ONLY! You can give yourself a little added incentive to keep up your yoga routine in the New Year by treating yourself to a new yoga mat. 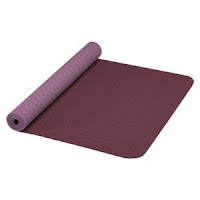 Today only (12/29), Target has the Gaiam TPE Yoga Mat in Purple for only $13.99 That's 60% off the regular price of $34.99. Even better, shipping is FREE! If you also want to work on some cardio, the Body Champ Silver/Black Magnetic Cardio Dual Trainer is on sale for 34% off - now only $224.99 - and again, shipping is FREE.